BeautyH2T: I went to the supermarket and I got.. I went to the supermarket and I got..
Well actually it was boots but that does remind me of a game we used to play in the brownies! First up, I have been so angling for some pastel nail shades after seeing some gorg ones on fellow bloggers pages, if only my nails were as lovely though! Went for the Barry M in Mint green as it is definitely similar to the chanel shade many are lusting after and only £2.50! Couple of coats of this does look great. ( excuse the awful photography my camera is so not up to the blogging malarkey!) One coat leave sit a bit uneven and an odd dull shade so I would recommend at least a double layer. I also got the Clinique instant brow lift which I read a great review of yesterday and it is finally in the right colour for my brows so very pleased, It goes on fantastically well, a nice natural look and i love the fact it is double ended, the other end is a highlighter which is a fab space saver but I do think the highlighter could be lighter as it is quite a dark shade, still very use able and stays well, some not particularly great swatches below the highlighter is in the middle. The packaging for it was nice but the price is still quite steep at £12.50 but with all the eyebrow woes I have had over the years I am willing to pay it this time. 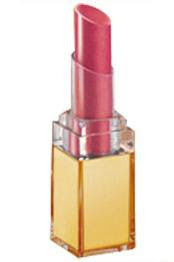 The pink Swatch above is my other purchase, the new Loreal Paris Colour Riche Shine Gelee Lip Stick in 102 Sugar Rose. I had seen a great swatch of it over on the lovely katie at mesluxes blog and it looked gorgeous on her lips. I too was impressed with how soft it does make your lips but my lips must be darker and sadly the colour does not pop quite as well but it still looks pretty on and it good for me practising actually wearing lip colour and not just balm. Gorgeous nail polish color! I have Essie's version of the Chanel color. Chanel started it all, as usual didn't they? LOVE the nailpolish and can't beat that price! The lipgloss looks gorgeous and I'm sure the lipstick looks as good on your lips!! Maybe try dabbing a tad of conceler on your lips before applying the lipstick so get a brighter colour? I thought the concealer trick might help brign out the shade, not had a mo to try it, but will give it a go tonight, even as it is now, I am really attached to it. Thanks for the inspiration! I do really like the clinique, I have struggled with my brows for weeks, this pencil does give a great natural feather strokes, it could be a touch thinner i think for more detail and the highlighter could be a lighter shade i thought, but in all I think it is good quality and the deep brown is amazing for my brow colou, Did your second Gaga face go down well, great theme for the staff BTW! what a cute lil blog!!! - i LOVE how you show how the products work with you! - i'm loven' the lipgloss - gonna have to try it out - and the green nailpolish .. loves it!!! .. thanks for checking out my blog - i joined to be one of your followers! .. LOVE if you would become one of my follwers as well!